Learning taxonomies are commonly utilized as a way of describing different kinds of learning behaviors. Educators and instructional designers use learning taxonomies to define and distinguish different levels of human cognition such as remembering, thinking, learning, and understanding. The word taxonomy simply means classifications or structures. Therefore, learning taxonomies are classifications of learning. Since knowledge is multi?dimensional and multi?layered, taxonomies help segment and define its different layers and aspects. Knowledge can range from remembering to applying. Learning can range from memorizing a simple fact to evaluating information in order to generate new ideas. A taxonomy describes and categorizes these different kinds, levels, and degrees of learning. Taxonomies are often used to guide the development of course curriculum, instructional methods or strategies, and assessments. 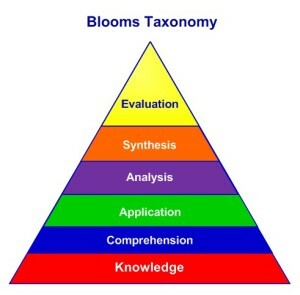 Bloom’s Taxonomy of Educational Objectives is the oldest and probably the most widely known taxonomy. Bloom’s Taxonomy classifies thinking according to six cognitive levels of complexity: knowledge, comprehension, application, analysis, synthesis, and evaluation. The categories are ordered from simple to complex and from concrete to abstract. Terminology: The revised version changes the names of each of the six levels. Structure: The top two levels are essentially swapped from the old to the new version. Emphasis: The revision emphasizes the use of taxonomy as a tool for alignment of curriculum planning, instructional delivery, and assessment. 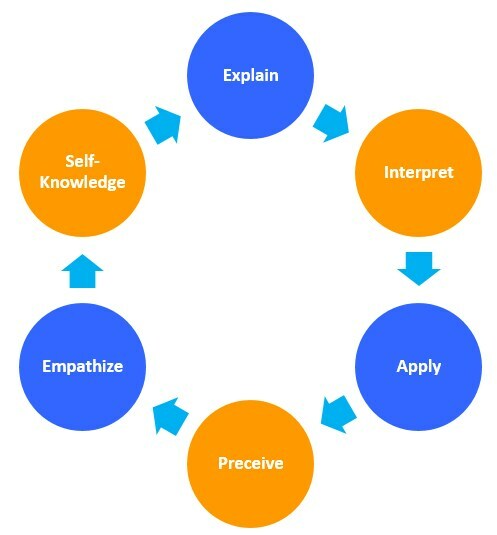 Hence, if you ask a person to do any of these six facets, you will be asking them to demonstrate understanding. Explanation: To be able to provide support and thought to the how and why of topics, events, and actions. Interpretation: To be able to effectively relate it to your life and things going on around you. Be able to tell meaningful stories, offer translations, or make it personal through images, anecdotes, analogies, and models. Application: To use knowledge in diverse situations and new contexts. To take what you know and use it in your everyday life. Perception: To understand other people’s point of view and opinions. To be able to understand something from more than you own point of view. Empathize: To understand someone’s feelings. You put yourself into someone else’s perspective and find value in how they feel. Self-Knowledgeable: To take understanding of others and use it to understand yourself. To be able to perceive your personal style, prejudice, projections, and habits. 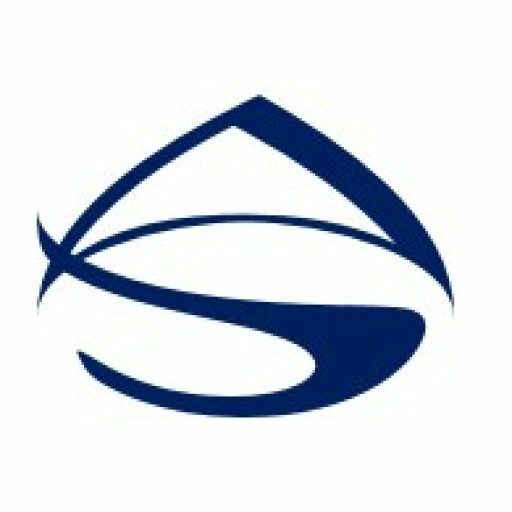 SOLO (Structure of Observed Learning Outcomes) Taxonomy is a systematic way of describing how a learner’s understanding develops from simple to complex when learning different subjects or tasks. The SOLO Taxonomy was devised by Biggs and Collis in 1982 as an alternative to Bloom’s (Cognitive Domain) Taxonomy. Through their work, Biggs and Collis looked at the Structure of the Observed Learning Outcomes produced by learners in terms of complexity. Their model describes levels of increasing complexity in a learner’s understanding of subjects or performance tasks. The SOLO Taxonomy is divided into five levels of understanding. It is hierarchal and each stage involves the previous and adds something to it. Fink’s Taxonomy defines learning in terms of change. Fink believes in order for learning to occur, there has to be some kind of change in the learner. If there is no change, there is no learning. Additionally, he believes significant learning requires that there be some kind of lasting change that is important in terms of the learner’s life. 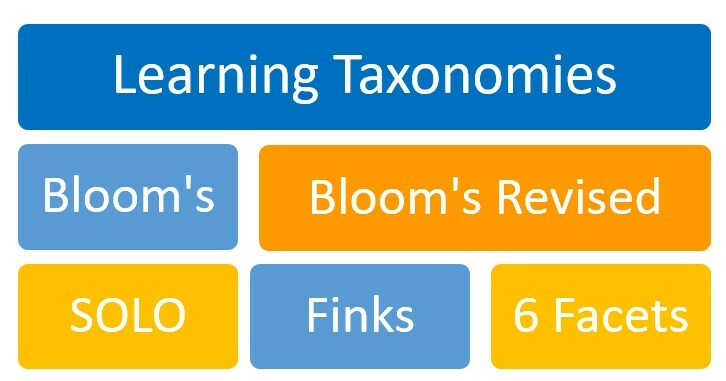 Finks taxonomy includes six kinds of significant learning. Unlike some of the other taxonomies, Fink’s taxonomy is not hierarchical. His is interactive. This means that each kind of learning can stimulate other kinds of learning. Additionally, Fink’s Taxonomy goes beyond cognitive processes and includes other goals of teaching. His taxonomy includes more affective aspects such as the “human dimension” and “‘caring” – identifying and/or changing one’s feelings.